Kingman, Arizona is situated in the scenic Hualapai Valley between the Cerbat and Hualapai mountain ranges. Founded in 1882 as an Atlantic and Pacific Railroad town, the city was named for railroad surveyor Lewis Kingman. Christened as the Mohave County seat in 1887, it grew into an important supply and shipping center for miners and ranchers in western Arizona. The commercial district that defined the town included the impressive Hotel Beale (319-327 Andy Devine Ave.), a two-story building built in 1899 of local stone and brick. In 1907, a substantial, stylish Mission Revival railroad depot was built after fires twice destroyed earlier, wood-and-concrete depots. That same year, the Hotel Brunswick (313-315 Andy Devine Ave.) was built to provide another lodging option. Early businesses marketed goods and services to both local and visiting populations and thrived during Kingman’s first decades. Built in 1888 and doubled in size by 1908, the Luthy Block (409 Andy Devine Ave.) occupied a prominent corner location and became the retail anchor of the business district. In 1899, Ed Thompson’s Saloon (323 and 331 Andy Devine Ave.) joined the hotels as a place for locals and travelers to drink and socialize. By the 1910s, roads and automobiles competed with the railroad for importance in Kingman. In 1914, the local section of the National Old Trails Road was officially marked through town. In a nod to the route’s significance, the owner of Ed Thompson’s Saloon renamed it Old Trails Saloon the same year. 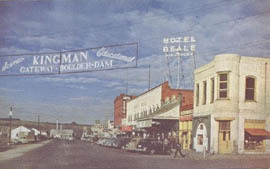 With increased automobile traffic, Kingman’s commercial core expanded away from the depot along Front Street (later Andy Devine Ave.) to the east and west and Beale Street to the north. The Old Trails Garage (307 and 308 Andy Devine Ave.) was established on Front Street in 1915 and represents the changing commercial emphasis to automobile repairs and sales. It was the largest and most complete automobile service garage in Kingman for many years. The John Mulligan Building (301-305 Andy Devine Ave.) was built in 1922. Its concrete construction, horizontal bands, and Mission Revival parapet echoed the earlier Luthy Block and reflected local efforts to create a cohesive feel for the downtown district, partly to appeal to California-bound automobile tourists. Route 66’s original 1926 course followed the National Old Trails Road through Kingman. The new federal highway boosted the town’s economy, as did other important federal activities that took place through the 1930s and 1940s. 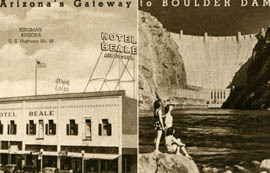 This included construction of the nearby Hoover Dam from 1931 to 1936, which once again inspired the renaming of the original Ed Thompson Saloon to the “Gateway Café” in reference to the town’s relationship to the dam. Military installations proliferated during World War II, and an airfield was established a few miles east of town bringing with it an influx of new residents and business. Route 66 facilitated the shipment of tungsten to Kingman for use in military applications. An era ended for Kingman when construction of Interstate 40 was completed, drawing through-traffic away from Route 66 and the downtown area. After a period of decline, the district is slowly experiencing revitalization. 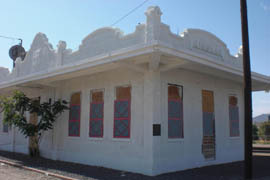 Acknowledging its historic significance, the National Park Service included the Kingman Commercial Historic District in the National Register of Historic Places in 1986. The National Park Service’s Route 66 Corridor Preservation Program also provided grant support for work on the Old Trails Garage Building, and just outside the district the historic Powerhouse has been restored as a Visitors Center. The Kingman Commercial Historic District encompasses nine properties on the 300 and 400 blocks of East Andy Devine Ave. in Kingman, AZ. The Hotel Brunswick, at 315 East Andy Devine Ave., offers overnight accommodations and a restaurant and bar open Monday-Friday 11:00am to 2:00pm and Monday-Saturday 5:00pm to 9:00pm. Call 928-718-1800 for more information. Though not in the historic district, the Powerhouse Visitors Center at 120 Andy Devine Ave. is a good first stop and provides maps for walking tours of historic downtown Kingman. The Visitors Center is free, open daily from 8:00am to 5:00pm, and wheelchair accessible. Call 928-753-6106 or visit the Visitor Center’s website for more information. Within the Visitors Center is the Historic Route 66 Museum. The museum is open daily from 9:00am to 5:00pm, costs $3 for seniors and $4 for other people, and is wheelchair accessible. Call 928-753-9889 for information, or visit the museum’s website. More information about the Route 66 Corridor Preservation Program can be found here.